The theft was spotted on surveillance cameras in the area, however, doubts on whether the theft was a real one began to emerge after Queensland police announced that the theft was not reported to them. 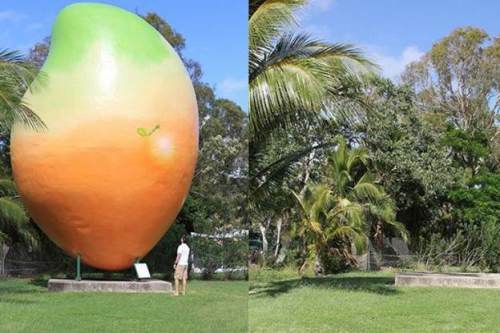 Despite Bowen Tourism vigorously denying it was a publicity stunt, it turned out that it in fact was a publicity stunt, carried out by chicken restaurant chain Nando’s, in order to promote the release of a new – you got it – mango-flavoured sauce. At the end of the day, the Nando’s stunt did more for Bowen than the Australian 150 ‘big things’ campaign. The mango-nap caused #MangoGate to trend on Twitter, and a few photo-shopped pictures of the mango’s whereabouts were posted, including one of it being among the 12 Apostles in Australia, and another where it starred as the “Wrecking Ball” in Miley Cyrus’ infamous music video. Winners included not just Nando’s but small town Bowen – now on the map at last courtesy of Nando’s and a Mango, and not the Australian tourist board.